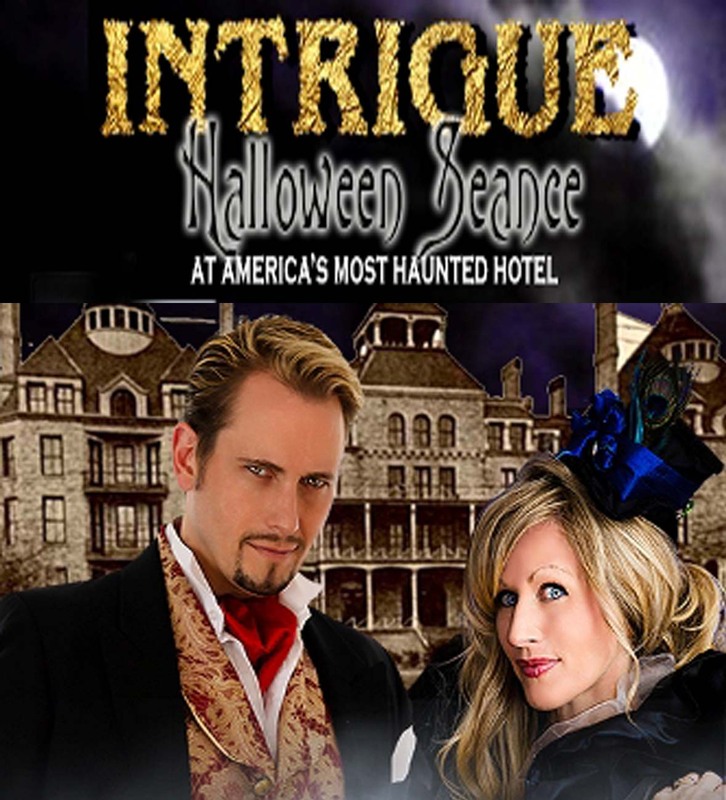 As if the 1886 Crescent Hotel & Spa wasn’t intriguing enough on Halloween, Sean-Paul and Juliane Fay, the headliners of Intrigue Theater, will return for the third consecutive year to this historic hotel’s Crystal Ballroom on October 31. The 2-hour performance begins at 10:00 p.m. with seating at 9:30 p.m. 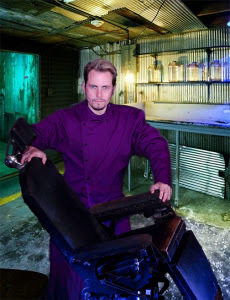 This special performance opens with nationally acclaimed illusionist Sean-Paul opening his antiquarian doctor’s bag and sharing some of the newest mysteries from Intrigue Theater. This will be followed by Juliane Fay, a medium of highly respected repute, who will call upon the energies of the spirits said to be residing in the hotel during a séance. Randomly selected members of the audience will be invited to the stage and a seat at the séance table to assist in reaching back to and communicating with “those who have crossed over”. Intrigue Theater has created a new segment based on the disturbing accounts of Norman Baker performing autopsies in the Morgue. Sean-Paul will extract tumors from an audience member with his bare hands using only Hypnosis to eliminate the sense of pain. This will be a one time performance to offer glimpse into what might have happened in the basement of the Crescent during its days as a Cancer Hospital. It will only be performed on HALLOWEEN NIGHT – at the Haunted Crescent Hotel. This a once-a-year performance has completely sold out by early October in years past, so those interested in attending should secure tickets early. It is an adjunct to the numerous Crescent Hotel ghost tours that will be conducted day and night on Halloween. Read “Haunting Ghost Experiences Revealed” by the Ghost Tour Guides, click here. The 1886 Crescent Hotel & Spa is a proud member of Historic Hotels of America. The hotel is located at 75 Prospect Avenue on Eureka Springs’ Historic Loop. Every night of the year, dozens of different people wind their way down the hallways and open, serpentine staircases of the five-story 1886 Crescent Hotel & Spa, “America’s Most Haunted Hotel”. Final destination: the hotel’s “morgue”. They just know they are strolling amidst what some would say are hundreds of spirits who still frequent this Historic Hotel of America located here atop Crescent Mountain. Each tour patron is eager to see something, feel something, smell something that they would categorize as a ghostlike experience enabling them to share that close encounter with their world. However, several of those strolling along those same paranormal pathways have been there before, every night of the year. These are the stalwart souls known as the Crescent Hotel Ghost Tour Guides. Miss Katherine was standing at the very bottom of the hotel’s open staircase with her tour group pausing before they entered the zigzagging trail to the morgue. While all were standing still, Katherine experienced a chill causing her to “grow goose bumps” and then momentarily she found it hard to breathe. The two ladies standing next to her turned pale and quickly asked, “Did anyone feel that? It’s the little girl. She is here. I can feel her!” They were referring to the story of the little girl that reportedly fell to her death from the fourth floor railing sometime during the early years of hotel operations. Where she supposedly landed was the exact spot where the tour group was standing during the literal chilling experience. To add to this story, one man said, “Oh, my. Look at this photo!”, a photo he had just taken prior to the ladies’ verbal declaration. He passed his camera around and clearly everyone could see a foggy mist in the shape of a little girl standing right next to the three women. Unfortunately he did not submit the image to the hotel’s paranormal website AmericasMostHauntedHotel.com as he said he would and as many do when they capture an apparition on a digital device.